Could you live a world without chocolate? Can you imagine autumn in Minnesota without Halloween pumpkins or family weekends picking apples at your local orchard? Did you have blueberries in your morning cereal? Tomatoes in your sandwich? Would you make it to work on time every morning if coffee was 30% more expensive? We owe one of every three bites of our food to pollinators, especially most of our fruits and vegetables. These animals (mostly bees, butterflies, and other insects, but also a few mammals and birds) are also needed by most of the world’s plant species to reproduce. Without them we lose major crops and ecosystems deteriorate. The struggles of pollinators have been front page news lately. Honey bees are suffering from complex interactions of pesticide exposures, habitat loss, and new diseases and parasites. The Monarch butterfly, Minnesota’s State Insect, fell to record low populations in 2013, partly due to the loss of milkweed in the Upper Midwest. 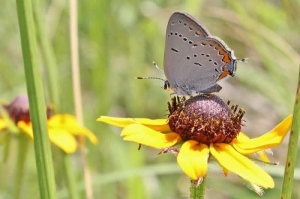 Several Minnesota prairie butterflies are in danger of extinction. Many other native pollinators (Minnesota may have 350-400 species of bees!) are also thought to be in trouble the same reasons, but we know far less about the status of most of them. Luckily, everyone can help! The Minnesota Zoo’s new Plant for Pollinators campaign provides simple steps that everyone can take to help. 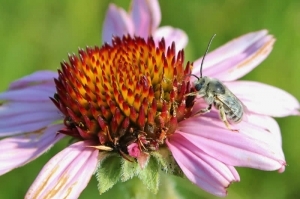 Along with a “What To Plant” photo gallery and a “Top 5 Minnesota Native Picks”, our Plant For Pollinators webpage encourages the planting of native wildflowers (beautiful and low maintenance!) like milkweed and black-eyed susan as well as the reduction of pesticides to help struggling pollinator populations.